My first recollection of Tottenham Court Road as an Area Manager in the 1980s was visiting the Station Manager’s office, then located in a lengthy but little-used passage in the base of an old liftshaft. The office was dreadful and everything in it was covered in a fine layer of black soot-like material that was virtually unremovable. 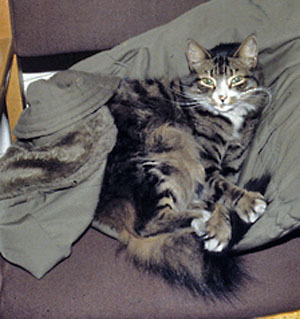 This extended to the station cat, a uniquely vile and filthy creature which had, it seems, been trained to slumber away long hours of inactivity on the station logbook and repel attempts to gain access to it by means of an evil look, hissing and extended claws. I don’t know where this disreputable creature came from, or what it got up to when it decided, periodically, to leave the office and go somewhere – perhaps to leap out and devour the odd passenger foolish enough to attempt using the emergency stairs, but more likely a good meal of rats or mice. I tried never to think about where it did its own business. Perhaps it was in the next door shaft where once had been an attempt to operate an air refrigeration plant, but the pit was by now filled with black stinking water that was home to some kind of flying insects. I trust this adequately paints a picture of the ‘back of house’ arrangements at this very busy station in those days. The station has an interesting history. Like so many others it began life as two stations. The Central London Railway (CLR) had one of its standard design buildings by the south-east corner of St Giles Circus with a frontage to Oxford Street. Opened in 1900, four lifts carried people down to passages at the east end of the platforms, which lay under Oxford Street itself. The Charing Cross, Euston & Hampstead Railway (CCHR) opened in 1907 but could not obtain suitable land for a station building and constructed a ticket hall directly underneath the surface of St Giles Circus with entrances from stairways at several of the street corners. Again, four lifts carried people below, to the north end of the Hampstead Railway platforms, which lay below Charing Cross Road. The lack of a surface building meant the lift motor room had to be at the bottom of the shafts here. The ticket hall was extremely congested but managed to adhere to the one-way flow principle adopted by the early tubes as a means of mitigating congestion, a principle for some reason not so evident today when it is perhaps rather more necessary. Although quite separate companies, the railways were connected below ground via lengthy stairs connecting the two lower lift landing levels, so interchange between lines was always possible and there was an interchange ticket office located in this connection as each railway at first had independent ticketing systems. 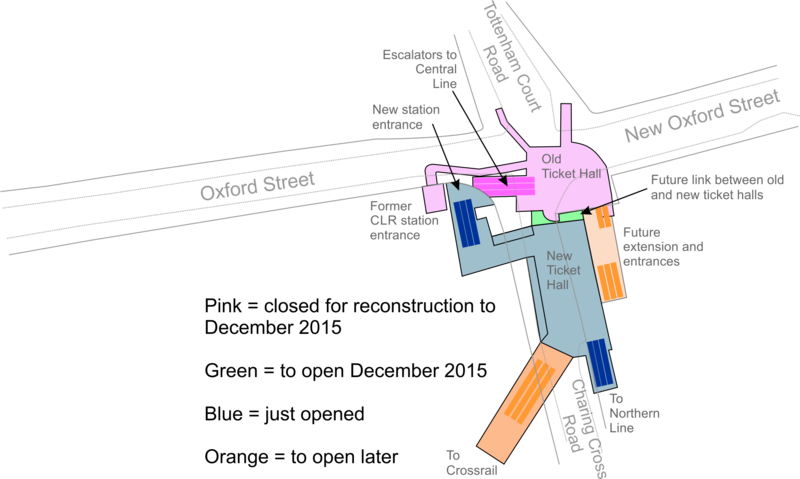 A confusing feature was that until 1908 the Hampstead station was called Oxford Street (there was a Tottenham Court Road station, but that was today’s Goodge Street, half a mile from the CLR station). Tottenham Court Road low level areas after Hampstead Railway opened in 1907. In 1925-6 the Underground was able to modernize what had become a very busy station. It was not that eight lifts couldn’t cope so much as a gross lack of circulating space, confusion about which entrance went where and the general inefficiency in having to work two unconnected surface stations. The plan was to bring everyone in and out via the below-street Hampstead ticket hall and to install escalators. 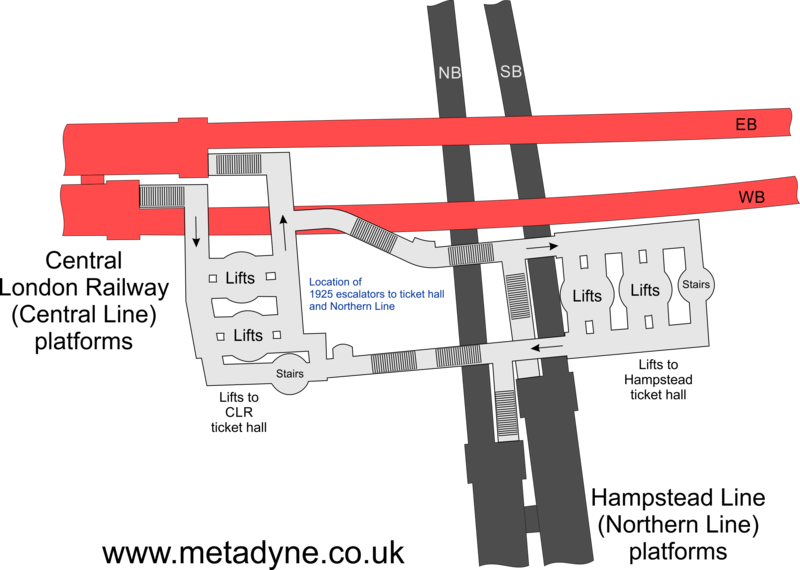 The upper flight was to lead from ticket hall to the base of the Central London lifts and their connecting passages to the CLR platforms. The existing interchange stairs (joined by a lower flight of escalators) would provide access to and from the Northern Line. To achieve this was tricky. The new upper escalators met the ticket hall such that the top landing and machine room required space occupied by a lift shaft but it was not actually possible to manage without all the lifts in service. Fortunately, one escalator had a footprint that avoided any lift shaft so this escalator in the upper flight (and both in the lower flight) were brought into service on 29 September 1925. 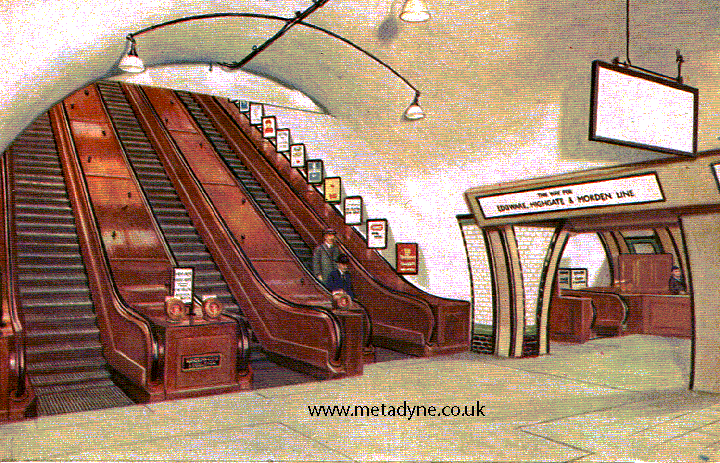 Once that was done two lifts could be withdrawn from service, the equipment removed and the shaft capped over so the two remaining escalators could be brought into service from 1 February 1926. 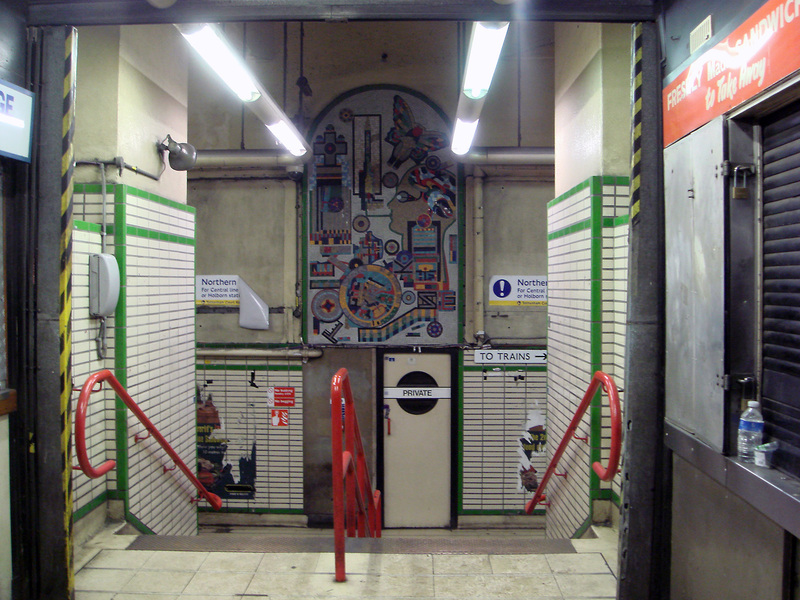 After that the remaining two Hampstead lifts, and all four CLR lifts, could be taken out of use. When that was done the other shafts could be capped. At the low level each of the two CLR lift shaft pits were slabbed over and made through-ways to help distribute passengers to the original stairways to the CLR platforms. The new ‘Hampstead’ escalators dog-legged back to the level of the old Hampstead lifts and descended parallel to the old interchange stairs, which were retained. Plan showing the intended arrangement when escalators were first installed. 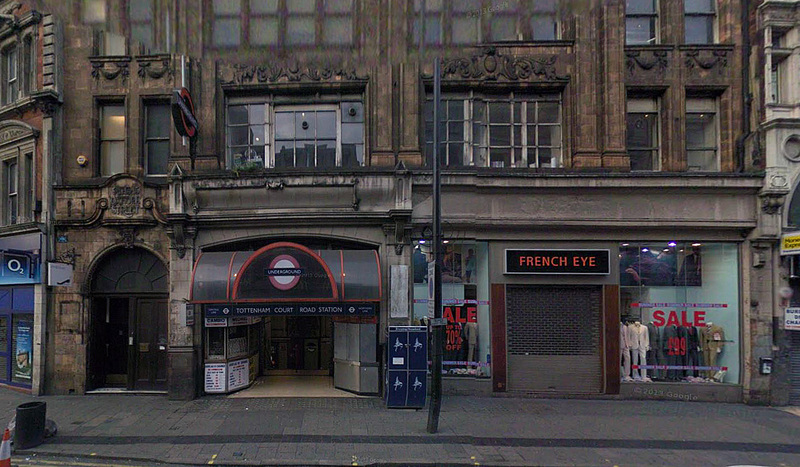 An entrance to the south side of Oxford Street was retained via the old station building, located near the top of the former CLR stair shaft (not sure this shaft retained its spiral stairs on reconstruction). Both the CLR lower lift landings were converted into concourse areas. At ticket hall level a new passageway (crossing both former lift shafts) connected the ticket hall to the original emergency stairs while a new subway was constructed from the other side of the ticket hall to the old CLR entrance in Oxford Street to maintain access from that vicinity – the old CLR stair shaft was used as a ventilation outlet and the other shafts capped off. In the Hampstead ticket hall, the old lift entrances were cleared away to leave a the ticket hall so familiar to us all until a few days ago, a new ticket office being installed against the north wall. Image of low level area just after escalators installed, back to former CLR lifts. Note absence of escalator uplighters. “Station Improvements.” Times [London, England] 29 Sept. 1925: 11. The Times Digital Archive. Web. 18 Jan. 2015. 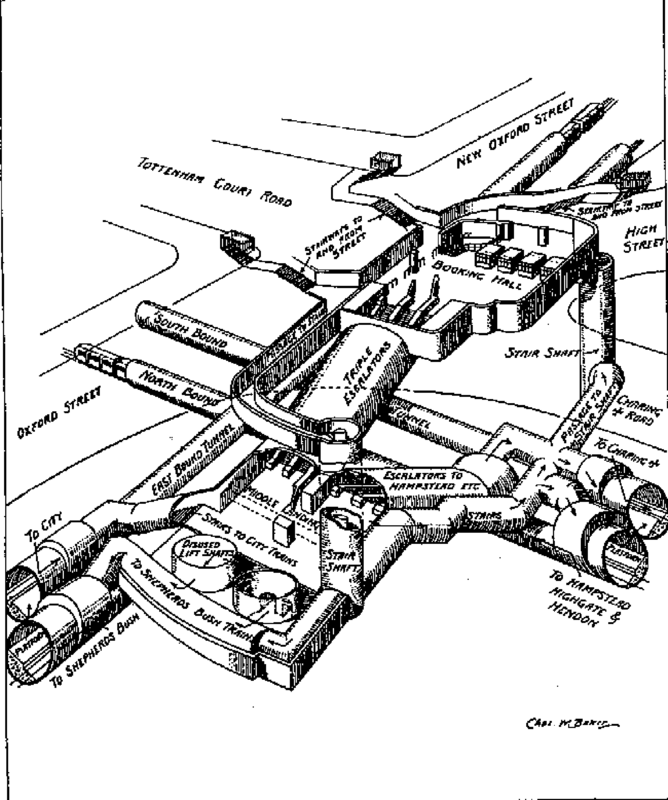 In 1930 a Metropolitan Water Board 24-inch main failed near the old CLR station allowing a huge quantity of water to enter the station and flooding the interconnecting subway (which dipped in the middle). This led to some unpleasantness between the Water Board and the London Electric railway. The latter wanted damages but the former suggested the failure was due to subsidence (the probably cause of which was the new escalator shaft immediately underneath it). The matter was settled out of court. After that mounting crowds caused two further changes. On 27 April 1933 a new Northern Line escalator mid-platform taking people to a new subway to the bottom of the main escalators; this always functioned as a Way Out and for many years in the evening peak both Northern Line escalators at the north end operated in the down direction, creating a helpful one-way flow. That this was built so soon after station reconstruction is a reminder how quickly circumstances can develop. [I use the name Northern Line here, even though it wasn’t coined until 1937, to avoid a lengthy and irrelevant explanation about line naming!]. With overcrowding still a problem, on 8 May 1937 a west-facing subway, parallel to, but above, the CLR platforms, was opened to distribute incoming passengers further along the congested platforms via two additional stairways. That, too, was not enough and on 15 November 1939 a new interchange subway was opened which led from the eastbound Central Line to the southbound Northern Line; this was a tortuous 210ft passage threading its way through the existing tangle and designed to avoid interchange traffic becoming mixed up with the very heavy in-out traffic – I think I recall it was intended to have only a one-way flow. After that, I regret to say, there were no more significant improvements until today – a space of 75 years during which things have somewhat changed. Former CLR station frontage before Crossrail work began. On 12 January this year, the venerable but shabby and appallingly small ticket hall at Tottenham Court Road was taken out of use after a life of 107½ years, and was replaced by a brand new ticket hall next door, but this is far from the end of the story and there are some points to draw out of this. Reconstruction had been hoped for during my time on the Northern Line around 1990 (a mere 25 years ago) as the station was already exceedingly unsatisfactory for prevailing traffic. LU drafted a so-called safety measures bill which was not so much focused on safety as reconstruction of Tottenham Court Road station to meet modern requirements (many property interests were involved and it was felt the bill would be less likely to be challenged under this name). The bill passed and became the London Underground (Safety Measures) Act 1991. The plans were drawn up already and an early start on much needed construction was hoped for. I had been consulted about the plans, which had passive provision for east-west and north-south Crossrail, and additional ticket halls and so on, and I recall that in its final form the station might have had over 100 escalators and occupied most of Soho (or so I imagined!). However, all that was hoped for immediately was the much smaller scheme for the Northern and Central Lines. I have neither time nor inclination to venture into Crossrail territory, but in essence the constant ‘are we’ ‘are we not’ going ahead with Crossrail saga, coupled with LU funding complications, then the PPP, meant that it was not feasible for the Tottenham Court Road reconstruction to go ahead on its own (despite what had been said to parliament about urgent need for safety improvements!). 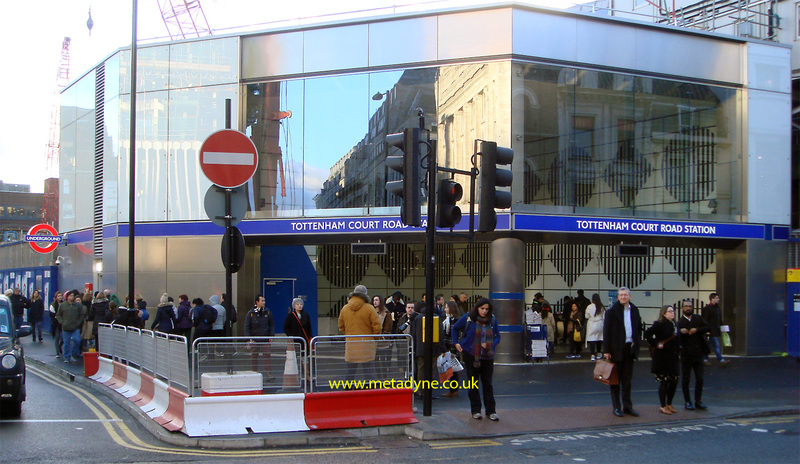 When Crossrail was finally given the go ahead then reconstruction would form part of the wider scheme, which is what is happening now (Tottenham Court Road will become a Crossrail station). Perversely, the link with Crossrail has delayed station reconstruction for about twenty years. Such delays are unfortunately not rare. Much-needed reconstruction of Oxford Circus, for example, was delayed by at least a decade because of uncertainty around the Victoria Line, and I am sure there are other examples. The old CLR entrance in its last week, looking very tired and shabby (even more than it so often did). The lift entrances once graced the area on the right and ran father back than this end wall. The old stair shaft is pretty much dead ahead and is now a ventilation duct that has to be preserved in the station redevelopment. The old ticket hall looking towards ticket office, escalators out of sight on the right. This tiny area is further cluttered by the columns supporting road surface. The group is standing above one of the old lift shafts. The newly-opened ticket hall is located directly beyond all this and will be joined up in due course. The object of bringing in the new Tottenham Court Road ticket hall on 12th January is not to cast the old ticket hall into the bin of history: far from it. The old ticket hall will be stripped out, and the escalators replaced and then it will be merged into the area just opened (which is right next to it) to form a vast open space, with lots of entrances, from which three flights of escalators will lead down to the lower levels. The part just opened, with its three escalators, just serves the Northern Line via completely new passages that serve the centre of the platforms. The old ticket hall area will be refurbished during the course of this year and when reopened (and merged into the part opened in January) will serve the Central Line. In the meantime the Central Line platforms are closed to allow all the construction work to proceed and modernization of the surfaces to take place (Central Line trains actually ceased calling from 3 January). In a final phase, when Crossrail is opened, the new ticket will be further enlarged with three additional escalators serving Crossrail platforms. The Northern Line escalators (No 1 & 2) and original interchange stairs will be retained for interchange only (these areas, too, are currently out of use). The old CLR entrance, already turned into a site entrance. This is all that is left of the old 1900 street-level building, the parts above and to the right already gone. This too will not be with us for long, but the dreadful canopy won’t be missed. 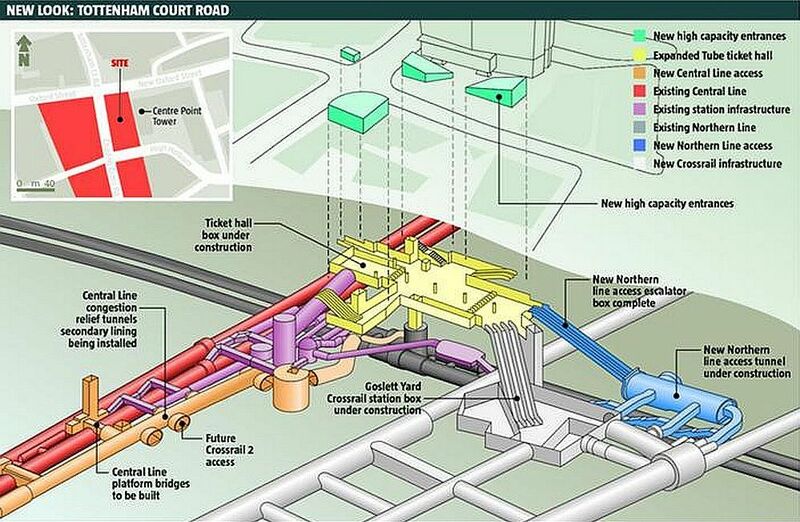 The plan below shows the various parts of the station after rebuilding is complete. 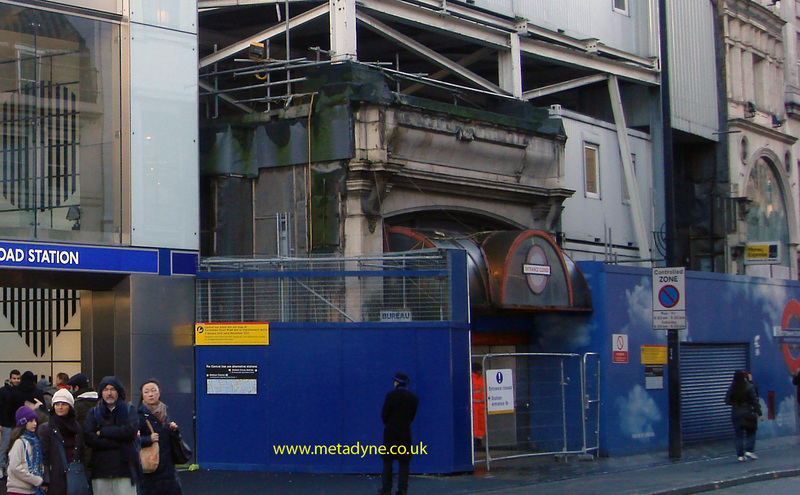 When the works to the old ticket hall are carried out during 2015 the existing clutter of supporting columns will be replaced by fewer (but larger) pillars to support the road surface above. While this great engineering work proceeds on its merry way controversy has broken out about the Paolozzi tiling, installed during the late ‘seventies. I’ve never got on with it as it is at its best only from visual representations taken from imaginary vantage points impossible to reach in real life, but then I’m no artist. In addition the constant fiddling about with station cabling and equipment means damage is inevitable. Apparently, though, much of this tiling is being saved for reinstallation. I hope this won’t be accompanied by any more of those awful oblong tiles with the horrendous and quite uncleanable grout lines which arrived at the same time. I shall court controversy by suggesting these designs were ‘of their time’ and have no place in the new station (amazingly the platforms of the Northern Line platforms are now narrower than they were, making the murals even harder to view). The station cat has long since departed for the great litter tray in the sky (perhaps the only occasion it will have ventured above ground) and as far as I know no replacement ever moved in. I don’t think a cat would like the new station much – no dark recesses in which to lurk. I’m not sure said cat approved of the Paolozzi tiles arriving during its tenure – those confusing patterns making it so much harder to spot the mice. If so, I think the cat had a point. More information about the current reconstruction of the station can be found on the TfL website by clicking the attached link HERE. 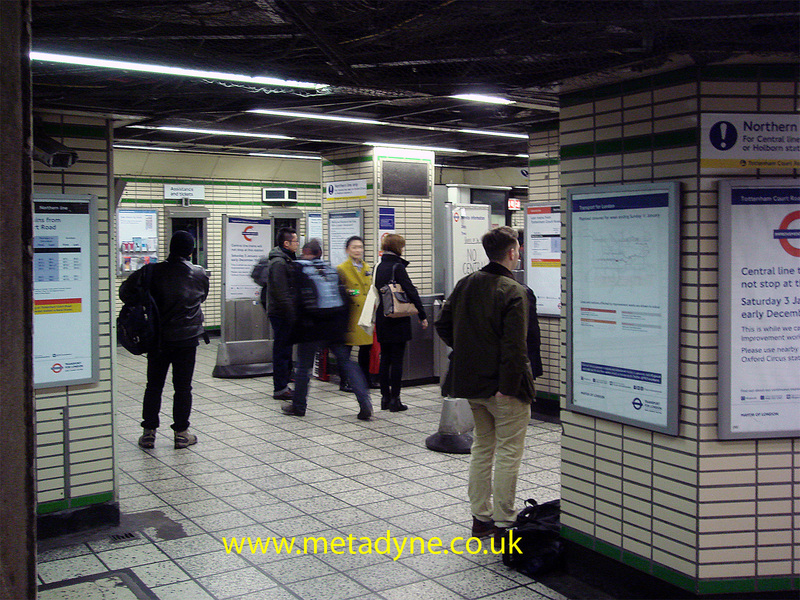 This entry was posted in London Underground and tagged Crossrail, Historical, London Underground, Tottenham Court Road. Bookmark the permalink.